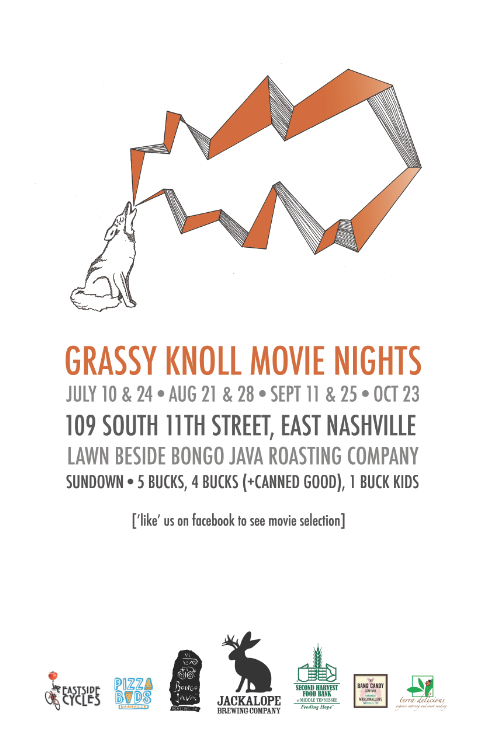 Since Movies in the Park will wrap up with their last movie of the year tonight, we were super excited to hear that Grassy Knoll Movie Nights in East Nashville will be starting up this weekend. Before you get too excited, let us offer this disclaimer: It’s not free. But it is pretty darn cheap at $5 a head and only $1 for kids, and you can even get a dollar discount if you bring a canned food donation for Second Harvest Food Bank. And we love our outdoor movies! We particularly love our outdoor movies when they are accompanied with beer (and even moreso if we don’t have to sneak it in. Er, what? ), so +1 to Grassy Knoll for their partnership with newbie brewery Jackalope Brewing Company. Jackalope will keep the beer flowing, Pizza Buds will be slinging pies (seriously, is that crust laced with crack or what?) and Bang Candy Company will be providing the treats. Another +1 for Grassy Knoll’s 7-week lineup. That means movies until Halloween, folks! While they can’t technically release the lineup due to some legal technicalities, we hear they’ve got quite a few crowd-pleasing cult classics on the table. From a western to a storybook romance to a horror flick for the final week in October, the movies will generally be family-friendly and crowd favorites. The name of the movie will be released each week on Grassy Knoll’s Facebook page, so head over there to like ‘em and stay in the know. Grassy Knoll Movie Nights will take place on the side lawn at Bongo Java East on Sunday evenings at sundown. The first event is this Sunday, July 10 (they’re showing Lucas), followed by movies on July 24, August 21 & 28, September 11 & 25 and October 23.